Learn more about what you can do with scenes and segments in Tobii Pro Studio and what the main differences are between the two. Scenes and segments are tools in Tobii Pro Studio that provide an amazing degree of analytical flexibility. When used properly, they allow researchers and analysts to carve out periods of time during the test recording over which meaningful behaviors and events take place. Although related in concept and execution, there are a few key differences that may lead you to choose one over the other. Let’s start with a summary of the most important aspects of scenes and segments. The most important practical implication of the differences between scenes and segments is that while you can generally use these tools interchangeably, if you want to isolate time periods on web pages where scrolling occurs, you must use segments and segment groups. Otherwise, the workflow is almost completely identical. The basics of setting up and using scenes and segments can be found in the Pro Studio user manual in sections 5.4 and 5.5, respectively so we’ll focus on the potential applications. As mentioned earlier, scenes and segments are used to isolate periods of time where things happen, things that are meaningful or important to the researcher. These periods of time can be associated with specific events (e.g., during the first visit to the navigation bar at the top of the page) or behaviors (e.g., gaze during the period after the first back and forth scan between two targets). Alternatively, they can be used to organize gaze analysis into epochs or intervals or for time series analysis. In the following illustration you can find a simple example of how this could be carried out. In this test, the image “PEZKISS.jpg” is displayed for a fixed duration of 10 seconds. The image is of a commemorative candy tin. Once AOIs are set up, gaze metrics are calculated for the entire duration of the exposure by default. However, in some cases, it might be more revealing to examine the characteristics of gaze over, say, three early periods of about two seconds each. Perhaps the changing gaze patterns in these intervals corresponds to perceptual or processing aspects that are of interest. Or maybe there is an interesting relationship in the order of viewing. Scenes give the analyst the ability to parse meaningful time slices and conduct fine grained analyses. 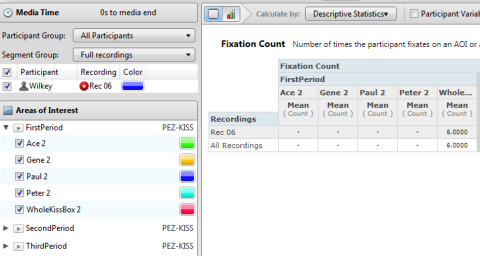 The analysis is done at the Statistics tab on the selected scenes (FirstPeriod is expanded). As S&S have similar basic functionalities you could accomplish pretty much the same thing with segments and segment groups. Here I’ve set up three segments and then assigned them to three different segment groups to enable analysis of each individual slice of time. If one wanted to sum up over multiple segments, then you would assign the applicable segments to the same segment group. Don’t worry about any inadvertent overlap in the segments as a fixation is only counted once if they are assigned to the same segment group. This will not be the case for scenes though. If two scenes overlap on the timeline, each scene will tally all the fixations during that time span. There is a catch, however. You can only select a single segment group per cycle of calculations. To get metrics for all three segments, you’d select a segment group, calculate metrics and then update at the Statistics tab to calculate again with the second segment group selected and so on. This differences relate to the fact that scenes spawn media items but segments don’t. Scenes and segments are highly flexible data analytic tools in Pro Studio. Together with Areas of Interest, they provide useful and fine-grained capabilities for defining not only the spatial extent of your analyses (AOIs) but also the temporal span (S&S). Used appropriately and with care, researchers can apply these tools to carry out powerful, sophisticated analyses of the most demanding stimulus presentations.